So you've picked out the dress of your dreams (or at least done some dreaming), and now it's time to focus your energies on styling your friends! We've collected some inspiration for you with these 2016 gown dress trends that might be just the ticket for making your 'maids shine, too—or if you're the attendant, for finding bridal party attire that helps you feel your best while complementing the look of the bride's gown and venue. 1. Asymmetry. One shoulder, one sleeve, crossover, wrap—asymmetrical bodices with diagonal necklines are a bold and contemporary design choice for bridal parties. 2. Convertible bodices. Soft sashes that can be worn three ways, detachable straps, open backs with loose ties—convertible designs are re-wearable (a hit with trends on a budget), fit the draped look that's so popular right now, and provide a subtle way to do mix-and-match. Who wouldn’t enjoy 10+ styles in one? 3. High necklines. Just like the demure jewel necklines and modern halters that crown runway wedding dresses, bridesmaid necklines are on the rise--literally. If you want a fashionable edge for your 2016 nuptials, going with a higher cut might capture that modern, sophisticated feel you're looking for when your wedding aesthetic is “of the moment.” If you want to bring down the modesty a tad, consider an illusion high neckline. A little peekaboo lace is pretty and feminine. 4. Cap sleeves. Another detail important to bridal gown design has made it to the 'maids: cap sleeves. Whether closely-fitted lace sleeves or soft, shirred folds of chiffon, barely-covered shoulders are the new 'it' accessory. Bonus: the angle they create around the neckline emphasizes both the collarbones and the waist. Win win! 5. Flutter sleeves. Many of 2016's trends are about movement, and this one is no exception. Fluttering sleeves mingle vintage inspirations with a touch more coverage—a winning mix in design, and starting to look like it might define the decade of the 2010s in fashion history. 6. Cropped tops. You're seeing them everywhere these days, so it's no surprise that crop tops have made it to the altar. Two-piece styles are daring modern options for the bride and the bridesmaid alike, but this trend can still be chic! If you pair the crop top (perhaps in lace) with a high-waisted chiffon skirt, you're golden. As long as you follow T-Swift's rule (no belly button) and show just a bit of your oh-so narrow waist, this look can work for most big days. 7. Keyhole necks and backs. Since high necks are in, you’ve gotta show a little skin somewhere, right? A keyhole back or neck is that daring detail we’re all looking for. Super chic and tailored. 8. Tea length. This demure compromise between cocktail-length and long, flowing gowns is perfectly twirl-able, slightly vintage-looking, and exactly right for showing off fabulous heels. It's a delight to pair with bare feet, too, if you're going for an outdoorsy woodland look, and with comfortable flats, it has ballerina vibes. How versatile! 9. Fit and flare. Standard silhouette combos include the bride in a ballgown with the bridesmaids in sheaths, or the bride dolled up in a mermaid dress with the bridesmaids wearing A-line. But the fabulous dropped waists and shapely flounce of fit-and-flare skirts are starting to show up in bridesmaid fashion, too. Sort of exciting, right? Everyone deserves to show off their curves! 10. Tiers. It's mostly seen on long dresses, but a skirt of multiple layers makes a charming way to add some body and sophistication to any sleek silhouette—it’s amazing no matter what the length. Tiers are fabulous on most body types, too, lying gracefully on slim figures and adding a proud glamor to curves. Tiered skirts are a little nostalgic (think Rose's red dress from Titanic) and a lot feminine; they're gorgeous with 2016's increase of soft, sheer fabrics. 11. Sheer layers. Even if they're all the same length (and for many lovers of light fabrics, the preferable length is “floor”), layers of chiffon have an ethereal, feminine feel—which is exactly why they're so popular for attendants. (They look amazing at outdoor ceremonies, too.) Dial up the drama with a contrast lining or go more delicate with a soft palette. 12. Full skirts. Tea-length ballerina layers, tiers, flounces—they’re all part of an overall trend toward a lot more flare and fullness. Whether the floof happens at the waist or below the hips, we're all about it … especially because you can move the look from polished simplicity to delightful fun based on fabric choice and accessories. The big picture in bridesmaid trends. 13. Mix and match. It's still in, and it's still gorgeous. To make mismatched bridesmaids work, pick a feature or two in common (all tea-length, all with ruffles, all some shade of purple, all super-bright with black lace) and go wild from there. 16. Metallics. If you're not convinced navy is the new black, try metallic satin or dupioni for the same crisp, high impact—gunmetal is one 2016 fave. Sequins turn up the look a little more and Pinterest proves those are oh-so hot right now. 17. Unconventional pastels. Even the classic soft wedding colors are getting a glamorous spin in this year's palettes. Taking their cue from 2016's optimistic Pantone palette, coral shades are getting deeper. Yellow, turquoise, and orchid shades are stepping into the picture, often in matte fabrics like (again!) chiffon. Classics like soft blue, mint, and pink are still strong contenders—how else to get that faded, vintage look—but many designers' pink options are lightening to blush as more unconventional pastel tints fill out the color wheel. 18. Ombré. Yep, it's on the dresses too! Gradients are everywhere in 2016, including in bridal party attire. Style your attendants in different shades of the same color—whether each lady picks whatever makes her complexion glow, or the maid of honor is set off in a jewel tone while the others wear a pastel, the look is breathtaking and coordinated, without being matchy. 19. Patterns. So far, they're mostly seen as one cheeky touch in a range of mismatched frocks, but bright retro prints, lace textures, and even stripes and gingham have so many possibilities for dressing the forward-looking wedding party. Geometric designs get a special call-out—Gatsby-esque all-over beading and sequins are having a real day in the sun. Soft florals are happening, too—and if you'll permit us a forecast based on what's showing up at fabric expos, we suspect that much darker floral prints might break onto the scene in fall 2016 collections. 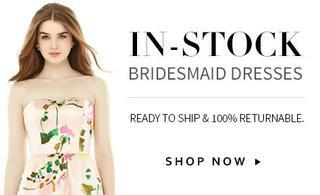 For the latest floral print bridesmaid dresses, check out Allure! So, which looks are you planning to give a little more momentum? Whether you're attending a big day in 2016 as a ‘maid, bride, or a guest in the second-to-last row of the chapel, we want to know which of this year's bridesmaid dress trends you'll be rocking!